I enjoy fish, but I don’t cook it at home often, due to the lingering smell. Until I created this recipe, it was either Seared Teriyaki Ahi or Poached Salmon. Discovering walleye was a revelation. It’s firm and flaky, not fishy at all, either while cooking or afterwards. It reminds me of sole, so it seemed a classic preparation was in order. I guess you could say this is a sole meunière on steroids. Next time, I promise to show the finished dish, but it was late and we were so hungry, we just dived in. 3 Tbsp Butter, one Tbsp set aside to finish the sauce. Begin by removing the fish from the refrigerator and dusting both sides with your sea salt, black pepper and other spices. Let the fish rest for at least 10 minutes outside of the refrigerator. Cold fish doesn’t cook well. Heat a large non stick sauté pan. Once it’s medium hot, add 2 Tbsp of butter. When the froth subsidies and the butter is just starting to turn amber, gently lay your fish, skin side down. Don’t move the fish too much as you want to create a nice crispy skin. 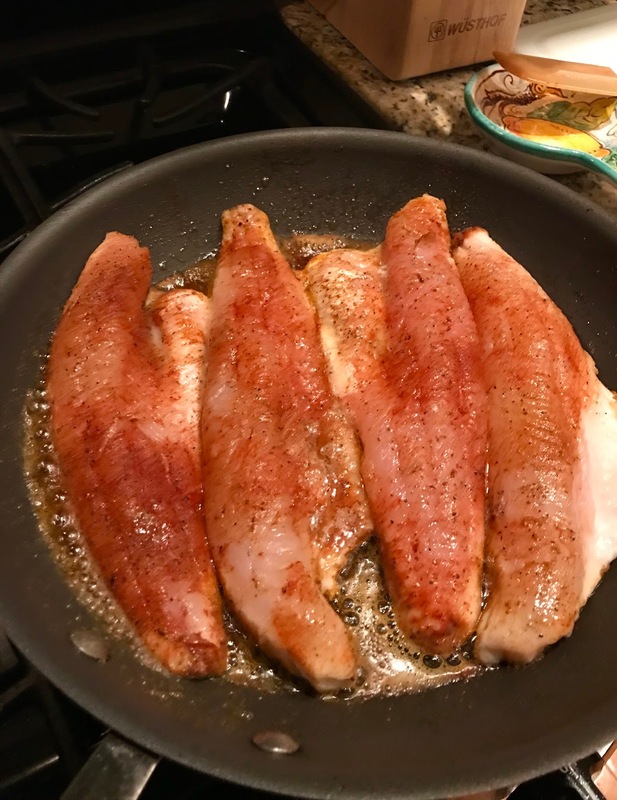 As the walleye is cooking, use a spoon and baste it with the butter. If the filets are not very thick, this may be enough to cook it through, but feel free to gently flip them over if need be. A slotted spatula is very handy here. Once done, remove them to heated plates. This is important, as fish will cool quickly and you need a few minutes to make your sauce. Add your lemon juice and wine to the sauté pan and bring the heat up to high and stir until the sauce starts to thicken and then add your remaining 1 Tbsp of butter and continue stirring until the sauce glistens. Spoon your sauce over the walleye and serve immediately. It is great with the oven roasted cauliflower rice. Note: I have found excellent quality walleye at Costco. It is fresh, not farmed and comes from Canada. 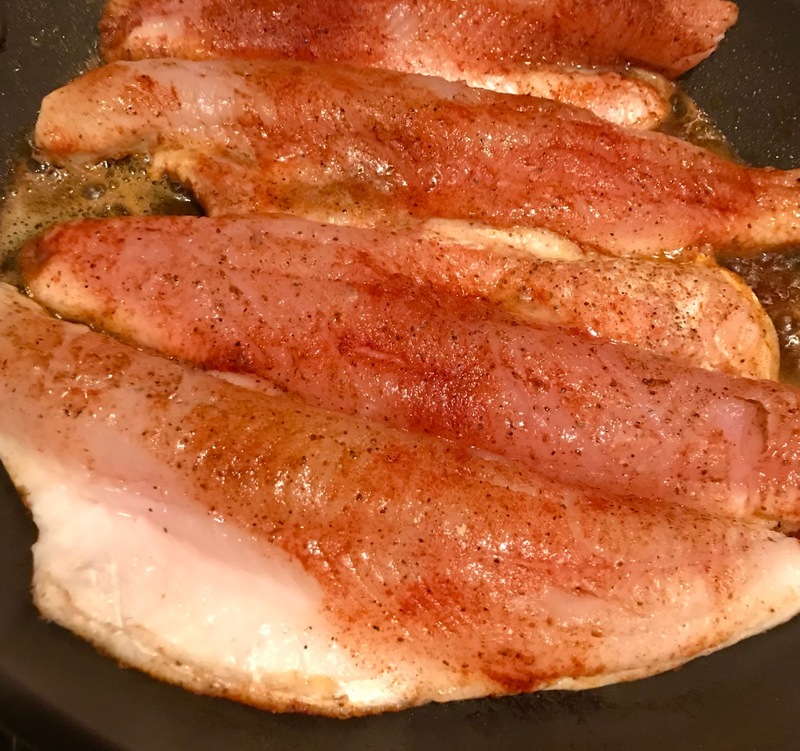 If walleye is not available, any flaky white fish will do, but you might have to contend with some fish odor afterwards.